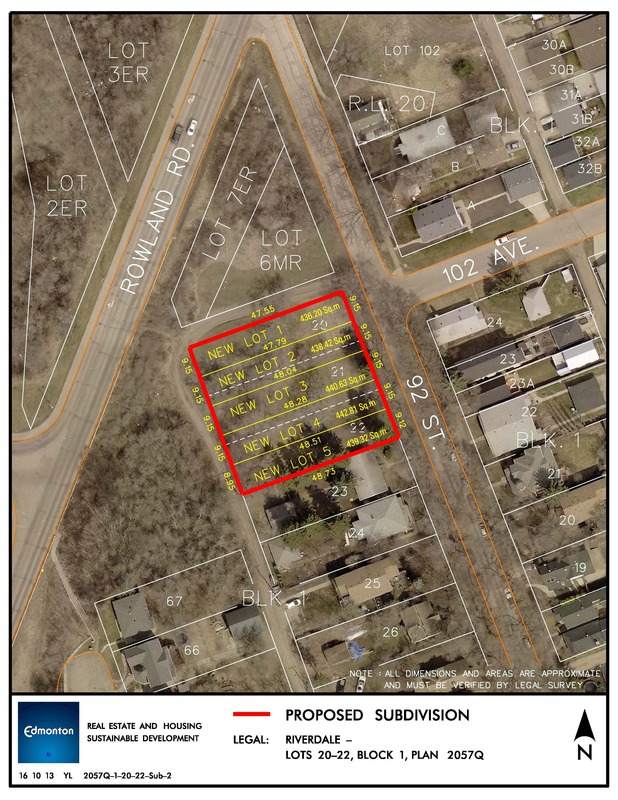 The City has 5 lots of surplus land in Riverdale, located on 92 Street and south of 102 Avenue. On April 30, 2018 City Council’s Executive Committee asked the City to explore options and determine feasibility of affordable housing on this lot. As part of this, the City has a committee to engage with community members and housing providers. The expression of interest (EOI) was an opportunity for housing providers to express an interest in developing these vacant building sites. The EOI closed on Thursday March 28, 2019. Outcomes will be presented to Executive Committee for deliberation later in 2019. The City conducted a series of information and public engagement sessions, including an online survey in early 2019 to collect input on the EOI and to create spaces for community members to share their perspectives on the surplus lots. The City will be releasing a What We Heard report based on the information and public engagement sessions. This report and the EOI outcomes will be part of a report back to City Council's Executive Committee later in 2019 to discuss feasibility and options for affordable housing. A report is due back to City Council's Executive Committee mid-2019. Prior to that, we conducted public engagement in early 2019 and released an EOI to housing developers. The findings of public engagement, along with the outcomes of the EOI, will be part of our reporting back to Executive Committee. It is here that Committee, and ultimately Council, will debate options and decide the next steps for the project. What type of housing will be built?/ Will affordable housing be built on that site?/ Will the land be sold at market rates?/ What will the density be? This decision will be made by City Council in 2019. As part of this, the City will present a report outlining feasibility findings and community input. Why are more non-market and affordable housing options being added? Riverdale currently contains 13% affordable housing which is below the 16% target set by City Council. As such, Council has directed administration to assess options and feasibility for affordable housing on this building site. Will the natural, protected area around the lots be maintained? The Council motion is limited to the 5 lots. It does not include any of the surrounding land. The City used the input gathered to shape an Expression of Interest (EOI). This EOI was sent out to housing providers, giving them an opportunity to let the City know if they are interested in developing these lots. The City will review these proposals for feasible offers in order to write a report on housing for this surplus city-owned land in Riverdale. This report will be presented to City Council’s Executive Committee in 2019.